Above is a map of today's ride after holding a Trail Maintenance Session on the Upper Gussy Trail. Before starting off some horseback riders came buy and the lead horse was ridden by Cindy, who is working with me to build the Upper Gussy Trail. We rode up the Brody Road and before we headed down the white trail, Rich had to check his voice mail before we rode into the no cell area of Upper Paugussett. Rich was on call for work. There were quite a few walkers in the forest today, too. As we were taking this break, three popped out from the white trail. Not very well dressed for the occasion for a hike - Upper Paugussett has a lot of ticks and you should be dressed accordingly, otherwise you will get them on you. Except for the downed tree in the swampy area, the white trail is fun to ride, there are two stone walls to ride through, and a mean little uphill climb that looks like a no brainer but unless you are in the right gear for it at the onset, you'll choke. I did, at least. Rich made it look easy. The white trail ends at the intersection with the Newtown Trailway, or Al's Trail. This is a multi-use trail that parallels Lake Lillilohnah through most of Upper Paugussett State Forest, only at this point it cuts inland to this point that is called Kissing Oaks. There are two oak trees that grew side-by-side and have grown together at points that make them look like they are kissing. There is a little box with a log that you can sign saying that you have been there. Then we headed north down the trailway. It's a fast down hill that snakes in and around trees, almost like a pump track and then ends at some really gnarly, technical rock gardens. There is one section that is almost unrideable due to the steepness of the trail, that is unless you want ruin it by skidding down the dirt just so that you can stay on the bike. This steep section ends at a stream crossing and then the trail descends through another gnarly, technical rock garden. At the bottom, the trail swings west, and follows the shore of Lake Lillilohnah. All along this part of the trail it flows through sweet singletrack with more and more rock gardens to sharpen your skills and harden your wits. There was once section that I fell on two years ago and ended up cracking a rib, and since then have walked it every time. This time, however, I didn't think twice and cleaned it's clock. 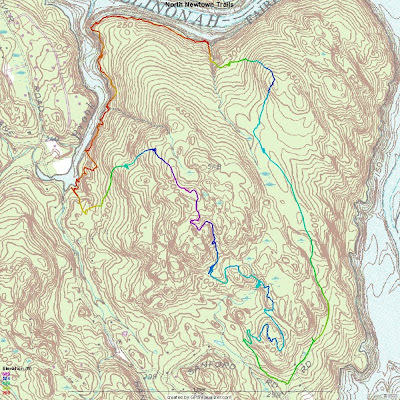 The trail intersects with the lower section of the Gussy Trail, which is more of a connector trail between Pond Brook and Brody Road (fire road that cuts the park in half). It's a nice little climb, to say the least. Once you are on the Brody Road, the real fun begins with a fun, warm up climb past the old Jalopy to get the blood pumping, in case the climb up the connector trail didn't do it for you. 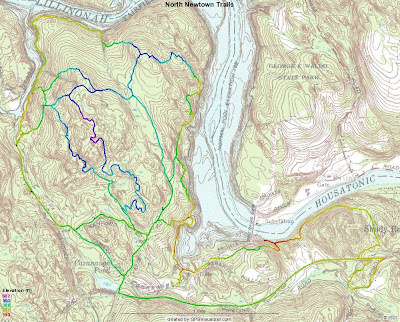 Then there is the long climb that starts where the blue trail intersects with the forest road, passes the intersection with the connector trail for the Mulikin Trail, climbs past the intersection with the yellow trail and then flattens out at the base before steepest section. The last climb must ascend at a pitch of 20 to 25 percent and on a bike, that is pretty steep. after the steepest section, you are not done because this portion of the climb doesn't stop until you are at the intersection with the Gussy Trail. As usual, In the video below Rich is shown ascending the second climb. He got up most of third climb, too. I did all three climbs without asking Granny for assistance, but keep in mind, I do this route a lot, on my single speeds. All that work pays off once you hit the Gussy Trail because it flows so nicely, even through the rock gardens and up and overs (thanks trail gnomes!). We stopped off at the Three Sisters and rolled them, then rode through the new benched section. I thought we would be the first through, but there were a fresh set of waffles already in the dirt! At Via Roma we ran into Tom Ramsdell who, like I said, was engaged in his own version of trail maintenance. We chatted for a bit and then headed off up the trail from here. He said that he smoothed out the Wet Spot and I was afraid to see what that meant. It turns out, he cut this part of the trail in half, putting all the rocks on one side for the bikes to ride atop and leaving the other side soft. I had to adjust a few of the rocks so it was more like an armored crossing and I might have to do a little more work on it later this week. Still it rides nicely. I for one like to ride rocks but I bet as time goes on, and the Wet Spot gets some moisture in the fall, winter, and spring, the section Tom opened up is going to turn into another mud wallow. At that point, we are going to have to haul some gravel in. The rest of the trail was business as usual. We rolled the roller at the blue trail crossing and then hammered home. Below is my composite map of North Newtown Trails. I can't decide what I like better, though, the lighter opacity topo or no opacity. With no opacity, you need to increase the track saturation on GSP Visualizer to 100% to make it really stand out. The question is, how will it look printed out. I think for the map to be really useful, some landmarks need to be called out especially if you are not familiar with the area. This map won't be complete until I have ridden the Dinglebrook Trails. I think it's time to take the 'Horse to Dinglebrook! Here is map of the trail system I mad a long time ago and had published Bikerag.com. It will give you some landmarks and directions on how to find this place. Newtown Bridle Lands Association has taken a greater interest in this area and apparently one there has been some blow downs in the area that some believe was the result of a micro-burst.